Curated Cocktails: Dystopian Districts – Happy Hour at the Museum! Join us for Happy Hour at the Museum! Whether you represent your chosen District or hail from the Capitol… may the odds be ever in your favor. MCASB is offering $5 signature cocktails created by Outpost at the Goodland‘s resident mixologist, Chris Burmeister. 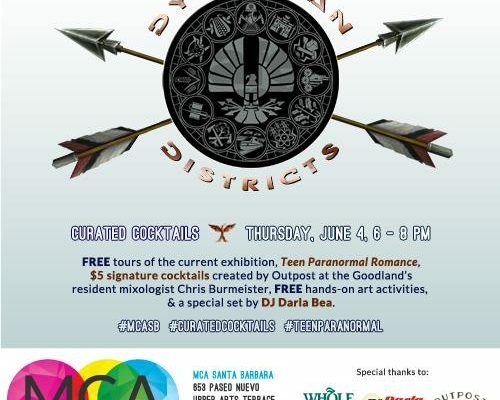 FREE tours of the current exhibition, Teen Paranormal Romance, FREE art activities, treats from Whole Foods Santa Barbara, and a special set by DJ Darla Bea. Register for Event: Curated Cocktails: Dystopian Districts – Happy Hour at the Museum! Your ticket for the: Curated Cocktails: Dystopian Districts – Happy Hour at the Museum!